Demonic Possession or Mental Illness? Why Didn't God Make A Perfect World? 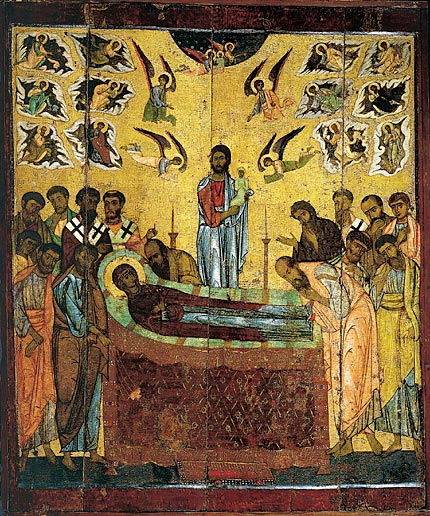 One of the biggest celebrations of Orthodoxy is August 15, the day of the Dormition. The Virgin Mary has been given many names in Orthodoxy, depending on the way she was iconographed, the theological status, the age of the icon, the way the icon was found, and the place of origin of the icon. There are also names given to her depending upon the time her celebration fell on. The icons of the Virgin were claimed to have been found in many cases in miraculous ways, which motivated Christians to establish churches in her name. Thousands of believers flock each year to venerate the image of the Virgin Mary and plead for help. Churches and monasteries dedicated to the Virgin Mary welcome visitors to brilliant festivities on August 15th, the day of her Dormition. Thousands of believers from all over Greece and abroad flock each year to attend the events that take place in Panagia Soumela, the historic church located on the slopes of Vermion, near the village Kastania. The church was built in 1951 by refugees from Pontos, in memory of the historical monastery, the ruins of which are located on Mount Mela, near Trebizond in the Black Sea. Here exists the miraculous image of the Panagia, crafted by the Evangelist Luke. On Dormition Day, the procession of the holy icon of the Virgin Mary is followed by many believers. On top of this great festival of Christendom, Pontian bands from Macedonia offer unique moments with traditional tunes and a long lasting celebration. The custom of pilgrim riders comes from the Ottoman Empire, when it was an opportunity for slaves to show their bravery and desire for freedom. On August 14 and 15, Siatista vibrates to the rhythm of unstoppable fun. On the eve of the feast, the squares of Hora, Gerania and the neighborhood of Bunia collect groups of horsemen, who lure local people and guests to the feast. On the day of the Dormition, the riders start out in the morning to venerate the image of the Virgin Mary at the Monastery located in Mikrokastro. At noon, the groups of riders come with their impressive horses into Siatista to the square of Hora. The celebration continues in the squares of Hora and Gerania, in the Town Hall Square, and the neighborhoods of Siatista until late evening. In the afternoon of August 15, a festive mass takes place in the Panagia Kosmosotira Church. From the temple begins one of the most moving processions of sacred images. The religious celebration ends with an enjoyable experience for the local people. Famous throughout Greece is the feast of the Dormition of Virgin Mary in Zagoria. In villages such as Vitsa and Tsepelovo, the commemoration of the Dormition lasts three days and offers the opportunity for endless feasting with traditional continental dances. While the first two days of the festival are open to everyone, on the third and last day of joy, the locals enjoy themselves with local Epirot dances. Potatoes, rice, and beef stew are some of the foods to be found on the lunch table given by the believers who flock to the Church of the Dormition, the Panagia of Thassos. After the procession of the icon, accompanied by a band, everyone gathers in the courtyard of the church in order to begin the festivities with dances from Greece, along with appetizers and wine. On the island of Skiathos, thousands of pilgrims flock from around the island and the neighboring places on the eve of the feast, where the Epitaphios (Tomb) of the Virgin Mary takes place in a unique atmosphere of piety, under the melody of praises for the Virgin Mary sung together by the islanders. Most of the pilgrims, starting from the city of Mytilene, walk 25 km to reach the churchyard, where they stay overnight. On the feast day of the Panagia, after the procession of the icon around the church, festivities begin with lots of music and dance events in the village square. Local festivals, street vendors, dance groups and folk bands are all part of the traditions in Agiassos, on Dormition Day. The pilgrimage to Panagia of Tinos is probably the largest religious pilgrimage of Hellenism. The island is completely associated with the Virgin Mary, and thousands of believers flock to the island every year to venerate the miraculous image of Mary in the Church of the Megalohari (Great In Grace) and to say their vows. The image of believers kneeling or climbing the stairs up to the icon is the most characteristic. The procession of the Epitaphios of the Virgin Mary is similar to the procession of the Epitaphios of Christ on Good Friday, with thousands of believers to follow with lighted candles. The festival lasts until August 23 and, along with celebrations for the Virgin Mary, the island celebrates the anniversary of the sinking of the battleship Elli by Italians which took place shortly before the war with Italy, in mid-August 1940. One of the most impressive churches in the Aegean is the early Christian church Ekanontapyliani, located in Parikia the capital of Paros, and it is one of the oldest and best preserved Christian churches. Believers from all over Greece gather here in mid-August to venerate the image of Panagia Ekatontapyliani (created in the 17th century) and take part in the festivities. After the procession of the epitaphios begins the great festival of the people, partying until the early hours, with traditional music, Parian wine and local delicacies. At the same time, in the port of Naoussa, dozens of boats approach the pier with lit torches. The view becomes more impressive with the arrival of ‘pirates’ who start the festival with island dances, especially the ”Balo” dance. On Dormition day, the Virgin Mary is celebrated in the chapel in Lower Koufonisi. After the services, food is offered by the inhabitants who are then transported by boats to Ano Koufonisi. Upon returning, locals and foreigners party until dawn on the island, with music, wine, ouzo and seafood provided by the fishermen of the area. For good travelers who can defy the distance and difficulties of access, the feast of the Dormition in Olympos, Karpathos, is one of the most devout. Food and slow dancing in a solemn mood last for hours and the atmosphere is the best that can be experienced by followers in celebrations of the Aegean. This custom is dedicated to the women. Women dressed in black take a leading role in the religious activity. They stay at the Monastery of Panagia Spiliani inside the castle of Knights, and worship and clean the area and the sacred vessels. Two parallel religious rituals take place – one by the priests and the other by the women in the role of myrrhbearers known as Enniameritisses (because they stay at the monastery for nine days) that follow strict fasting, doing 300 prostrations every day and singing. On the day of the Dormition, the Liturgy is followed by a procession around with the icon of Virgin Mary to the village to bless the feast. The Enniameritisses hold trays with boiled wheat and pave the way to the sacred icon. The feast starts when the icon arrives at the village, with the traditional dance of “koupa”, singing and drinking plenty of wine, while Enniameritisses withdraw. On the island of Patmos, the island of Orthodoxy, where everything revolves around the historic Monastery of the Apocalypse, the monks follow the custom of the Epitaphioa of the Panagia, a custom of Byzantine origins. The gold epitaph of Mary wanders the streets of the island in a grand procession, while the bells of the monastery and other churches ring incessantly. Hundreds of Kassiots and foreigners from all over the world flock to the island to venerate the Virgin Mary, have fun with the honored traditions and try Kasian local delicacies. At the Monastery of the Panagia in Leipsoi, the Virgin Mary is not holding the Holy Child, but the Crucified Christ in a unique image of the Christian tradition. The Panagia of Death is celebrated on August 23. According to the custom, held since 1943, spring lilies are placed around the icon, and then die and bloom again in August. Numerous believers gather each year in the courtyard of the Holy Monastery of Panagia Fidousa in Markopoulo, Kefallonia to see the “Panagia of the Snakes.” Every August 15, small snakes appear in the belfry and the church committee collects them in the yard of the Holy Temple. According to the tradition, snakes bring good luck to the island. If they do not appear, it is a bad omen, as happened, for example, in the year of major earthquakes in Kefallonia, some decades ago.